If you are repowering your boat, Beta Marine diesels are a superior engine that is smaller, quieter, with less vibration and more power. 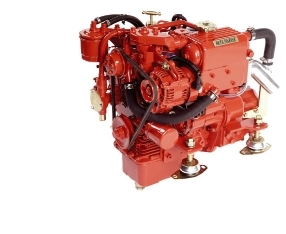 In fact, all Beta Marine Diesel engines are power rated at continuous rather than peak RPM. Most older engines were rated at peak RPM, providing a false sense of more power than you really had. And since the engine is based on the Kubota diesel, replacement parts costs are much more reasonable "street" prices rather than marine prices. If your engine is old, but your transmission is still in good shape, we can provide you an engine with the "bobtail" option, allowing it to interface with your current transmission. That will save you money. Give us a call and tell us your boat model, prop size and pitch, current engine, and we can provide a quote on a drop in replacement that will be quieter, more fuel efficient, more compact, and weigh less. Our toll free number is 888-792-BETA (2382). Here is an ad that ran in Blue Water recently. It has a good list of engines that are commonly being repowered using Beta Marine Diesel engines.